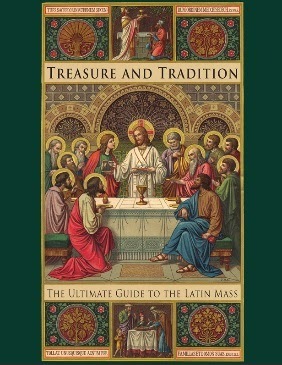 RORATE CÆLI: Rorate book review: "Treasure & Tradition: The Ultimate Guide to the Latin Mass"
Today's review is of the St. Augustine Academy Press book "Treasure & Tradition: The Ultimate Guide to the Latin Mass." Rorate received an early copy of this before it went up for sale. And the book lives up to the highly praiseworthy reviews of leaders such as Raymond Cardinal Burke. The book -- which is great for children, adults new to tradition and those of us who have assisted at the Traditional Latin Mass for years -- not only does a wonderful job explaining the Latin Mass but also delves into the Mass' history and explains the meaning of traditional feasts, unfamiliar terms and practices. “I am pleased to report this little book fuels piety in a number of ways. It reveals a literal understanding of the sacred Latin Language used in the prayers and rubrics at the Holy Mass, making it easy to mediate on the sublime orations being offered...[it] also provides many fascinating historical and catechetical lessons on each page that are accessible to all, not only in writing but in pictures and diagrams that direct the imagination always toward heavenly things. It is clear to me that this guide to the Holy Mass is long overdue and should be welcomed by all not only as a way to deepen their love for the Traditional Latin Mass but also to foster and fuel their piety.” -- A Traditional Priest and Friend of Rorate. You may purchase this fine book now for 10% off by clicking here.